How to keep yourself on solid footing when shooting in streams and slippery conditions. Hey guys! Brent here with part 7 of my 7 part Quick Tip series: Photographing Waterfalls and Streams. Today’s tip is another one about equipment. When out shooting in wet conditions, one of the most important pieces of “equipment” you can have is an appropriate pair of shoes. 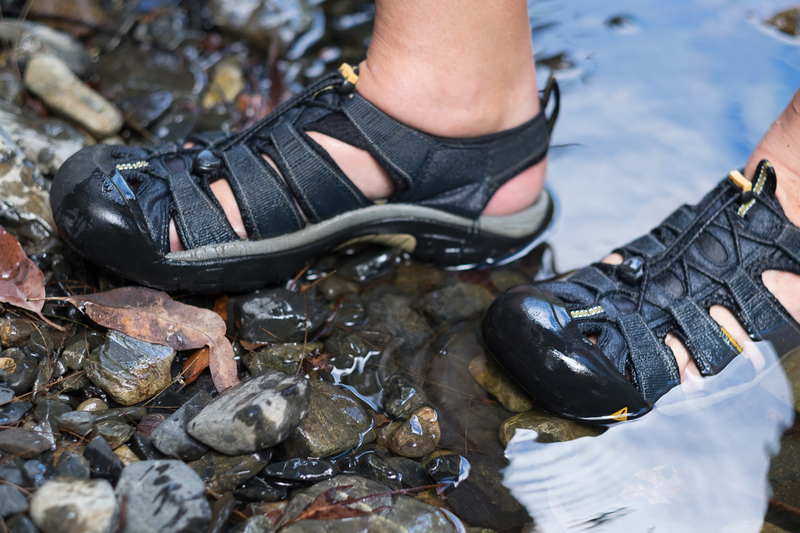 It’s not something you’d think of right away, but when you’re walking around in streams and on wet riverbanks or trails, a good shoe is a necessity. Watch as I give you some things to look for in a good water shoe. 1. The first and most important thing you want to look for is a shoe that you can get wet. 2. Next is a shoe that has a sole with good traction and non-slip properties to prevent slips and falls. 3. You’ll also want a material that is strong enough to protect your feet from sharp objects. 4. Finally, you need to be sure your shoes will stay on your feet, so straps around the back that close securely are a must. The last thing you want to risk is losing a shoe in a flowing stream of water! Two quality brands with good reputations to consider are Teva, which is my favorite, and Keen, which is Johny’s. I’ve had mine for 15 years and they’re still holding up very well. One last little tip for you today: Remember to use your tripod for support when you’re walking through the water. Even with special shoes, rocks can be mossy, making them slippery, and a tripod is a great way to give yourself a “third leg.” Any edge you have with regard to balance is going to be a big help. Learn to take Amazing Landscape Pictures in Just 14 Days! Tips For Photographing Water in Cloudy Conditions. Why a Quick Grip Tripod Head Works Best for Landscape Photography. Discover the automotive accessory that moonlights as a camera necessity when photographing waterfalls. What footwear challenges have you had when shooting out in nature? Great water shoes. I have a similar pair that I use about 3 months of the year. Five months of the year I count on my warm winter boots, rated to -40 C…knee high, waterproof for stepping in deep snowbanks, insullated for long hours ouside but with a lightweight, flexible rubber outsole for grip and endurance. Good boots are worth their weight in gold! What you have to say about foot wear in streams is true. However, your streams must be warmer than those in my part of the world. Here, except for the warmest part of the summer, the feet would freeze in sandals. I wear high top barn boots (rubber) most of the time.